Virginia Tech spent all week listening to commentary about how a revitalized Virginia football team was about to change the landscape of the rivalry, and that Tech’s No. 5 ranking was the result of a weak schedule that included no significant wins. Well, after the shellacking Tech dealt Virginia at Scott Stadium Saturday, a few certainties exist. One, Virginia Tech is heading back to the Atlantic Coast Conference Championship game. And two, Virginia’s road to a level playing field with VPI is a mountainous one. No. 5 Tech took care of affairs with a 38-0 win against No.24 Virginia on Saturday, cruising to its fifth Coastal Division title in convincing terms. Virginia Tech’s dynamic duo of quarterback Logan Thomas and running back David Wilson both made solid cases for consideration for ACC Player of the Year. Thomas threw for 187 yards while Wilson had 153 rushing yards and two scores. Virginia Tech will get a rematch with Atlantic Division Champion Clemson in the ACC Championship Game Saturday evening in Charlotte. The Tigers will limp into the game having lost two straight games including their own blowout defeat to in-state rival South Carolina Saturday evening in Columbia. Clemson handed Virginia Tech its only loss of the season, 23-3, in Blacksburg on Oct. 1. Since that game both teams have ended in opposite directions. “I hope that offensively we are a better team now than we were at that time,” Tech coach Frank beamer said of the rematch. Saturday’s win over Virginia was Tech’s second against aranked team this year. Entering Saturday’s game against Virginia the feeling was that the Cavaliers, winners of four straight and ranked (No. 25) for the first time since 2007, were poised to regain the upper hand in what had become a one-sided affair. The 38-point victory was the second largest win for Tech in the series and largest victory over the Wahoos since a 48-0 drubbing in Scott Stadium in 1983. Tech players commented after the game of the importance of delivering a statement to Virginia of who actually controls the conference. Consider that at approximately 7 p.m. Saturday evening that message was firmly delivered and received. “We just wanted to make those guys respect us, hit them in the mouth and keep hitting,” said Hokie cornerback Jayron Hosley. Virginia tech built a 14-0 lead at half on a 14-yard scoring run by Thomas and a 16-yard scoring reception by Jarrett Boykin. 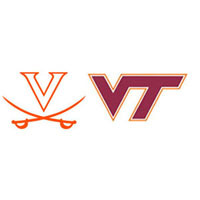 Tech’s defense imposed its will against Virginia the entire contest and with the aid of some timely plays tossed a shutout against the Cavs, who advanced into Hokie territory six times during the game only to be turned back on every opportunity. Perhaps the costliest miscue for Virginia came right before the end of the opening half. The Cavaliers advanced to Tech’s 20, but quarterback Mike Rocco lost a fumble on a sack. After that, things went bad for the Cavaliers-quickly. Wilson scored twice on runs of 27 and 38 yards to make it a 28-0 game and send the Virginia faithful (?) heading for the interstate. In the end the Cavaliers managed just 241 yards on offense, including a paltry 30 on the ground – a season low – and committed four turnovers. Virginia has not beaten Virginia tech since the Hokies entered the ACC eight years ago. Indeed, Virginia may be headed in the right direction with a solid recruiting effort in the state, but Virginia Tech demonstrated Saturday it has no intentions of loosening the grip on the stranglehold they have overtheir in-state rival. If Saturday’s game was a boxing match, the Hokies clearly scored an early-round KO.